Composed between 1860 and 1934, the works on this disc hail from a momentous period in Russian music – from the emergence of a national Russian school of composing advocated by the group called ‘The Mighty Five’ (of which Borodin was a member), to Stalin’s denunciation of Shostakovich’s opera Lady Macbeth of Mtsensk, which was to cause generations of Russian composers to harness their modernist leanings. To look for evidence of such historical circumstances in the present programme could however be misleading. Alexander Borodin’s Sonata in B minor (an early work which was published only in 1982 in a completion by the composer and musicologist Mikhail Goldstein) was inspired by a theme from Bach’s Sonata for solo violin in G minor, a thoroughly ‘un-Russian’ source of inspiration. And although Sergei Rachmaninov’s Sonata in G minor – and certainly his Vocalise – has a broad tunefulness which might be thought of as ‘Russian’, it was composed after the failure in 1897 of his First Symphony, when the country’s musical establishment turned its back on the young composer. As for the music of Dmitri Shostakovich, there is certainly a big change in style after the official criticism of Lady Macbeth in 1936. It’s equally true that his Sonata in D minor does point towards a new direction – but the work had been composed in 1934, implying that the seeds of this change of style were already present before the articles in Pravda. 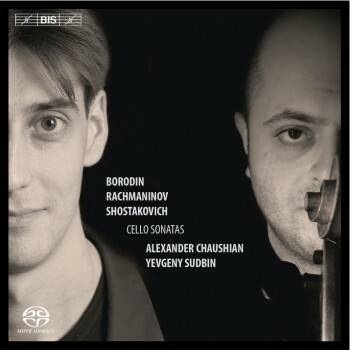 Whether typically Russian or not, the three sonatas are here given warm and inspired performances by the Armenian-born cellist Alexander Chaushian with Yevgeny Sudbin, his chamber music partner of long standing, at the piano. The two have previously recorded sonatas by Mieczyslaw Weinberg for BIS; a disc which was hailed as ‘the best possible case for a reappraisal of this undervalued composer’ in BBC Music Magazine, while the reviewer in International Record Review found it ‘difficult to imagine finer performances than these’.